At Pleasure Is All Wine® we pride ourselves on our outstanding and vast wine selection. Not to mention, our eclectic selection of craft beer. We have something for everyone, and for every occasion, at all price points. So if you are looking for your favorite everyday wine, collecting for your wine cellar, or you are planning a wedding, Pleasure Is All Wine® has it or can get it. We have something for the novice beer drinker and the afficionado. If you don't know what you want, we can help simplify what can sometimes appear to be a daunting task. We will skillfully and happily point you to the right wine and/or beer at the right price point. We love our wines and our beers and we love our customers! We are always adding to our extensive wine selection come on by the shop to discover that special bottle that we have selected. Our expert staff can help you determine your new favorite wine. If we don’t have it you don’t need it, but we can always order it. If you appreciate good food and good wine, then you will most certainly appreciate good beer. At Pleasure Is All Wine® we offer a large selection of Craft Beers, including draft beers. To help with your choices of beer, we include shelf talkers with tasting notes and alcohol content. They are priced per unit, so you can build your own 4 or 6 pack to suit your personal tastebuds. 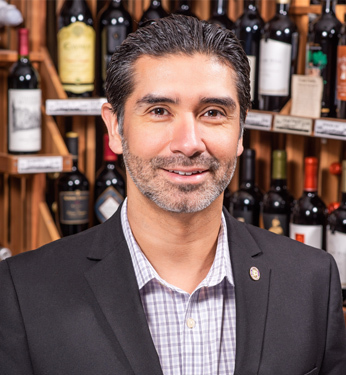 My name is Carlos Cisneros, I have been in the wine and restaurant business for over 18 years in Birmingham. I carry two certifications in wine, certified sommelier and a level two certificate with the Wine & Spirits Education Trust. My experience not only comes from certifications but from various fine restaurants around town such as Fleming’s, J. Alexander’s and Ocean. I am currently perusing higher certificates in wine to further my education. Originally from California but grew up in a military family, I’ve had the opportunity to live in many different places and for the past 20 years I have called Birmingham home.